With the emphasis on testing in our classrooms, with inadequate resources in our schools, with the neglected communities that our students live in, we need non-governmental approaches to give greater opportunities for our children. Formed in Summer 2008, Play & Learn L.A. is an initiative of teachers and community activists frustrated with the lack of educational enrichment opportunities for families in South & East L.A. Since the founding of Play & Learn L.A. we have attracted an ethnically diverse and resourceful leadership team. The Play & Learn L.A. founders wanted innovative ideas, and having worked together in the past, approached attorney and community activist Scott McVarish. They asked him to create an initiative to address two issues in their communities in East and South Los Angeles: First, the lack of an infrastructure for educational and fun enrichment programs that excite students; and, second, the lack of quality parenting courses for new families and other caretakers. 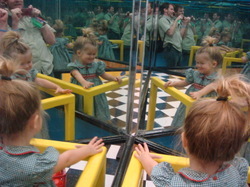 McVarish created the unique idea of pairing interactive and educational children’s play exhibits with strong early-education and parenting-education programs. The “Play Center” would provide a safe, engaging and inspiring place for children and their caregivers to play together and learn foundational skills necessary for school readiness; the “Family Center” would help teach parents and caregivers “best practices” in raising their young children in order to intervene in the destructive cycle of poverty. Play & Learn L.A. is a non-profit 501(c)(3). education enrichment opportunities within a 2 mile radius from my home. Two of my colleagues on the Play & Learn L.A. Board live on the eastern edge and southern edge of South Los Angeles respectively. A search in their neighborhoods found only 2 institutions (a Parks and Recreation Center with uncertain hours and a small library) within a 2 mile radius that offers early education enrichment opportunities. This gap in opportunities for children between the Westside and the lower-income neighboring communities is a social injustice. Play & Learn L.A seeks to bridge these gaps so that all of our children may thrive.